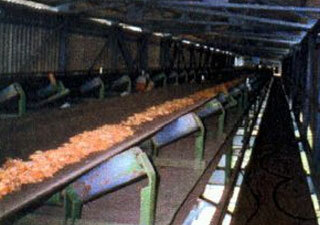 Smooth operation of Belt Conveyor to carry the incoming particles of wood, Bamboo Chip, into wood chiper and cool into the washing zone, also at a higher elevation. The downtime of system is negligible as the entire system is designed for continuous process resulting into almost no loss of production which ultimately gives higher outputs. To eliminate dust we can provide the belt with closed hood covering which has the flexibility of taking elevation even at 27 degree (max).